New Delhi: Japan International Cooperation Agency (JICA) has been a staunch partner to Indian infrastructure development with the Delhi Metro rail project being an outstanding example. Tomohide Ichiguchi explains that JICA’s engagement in India is multifarious—spanning metro rail, urban infrastructure, power distribution and even human resource development. In the years ahead, JICA will continue to focus on infrastructure development, giving more attention to quality and sustainability, asserts Ichiguchi. Japan has been amongst India’s oldest partner country with diplomatic relations dating back to over six decades. What would you regard as major milestones in the Indo-Japan cooperation journey? JICA is not able to answer the question on diplomatic relations. As far as JICA’s activities in India is concerned, there is a number of major milestones achieved including being the largest bilateral partner for India, providing the largest amount of assistance to India among the recipient countries, dispatch of more than 6,000 Japanese experts to India, training of more than 5000 Indian people in Japan and other countries, emergency assistance to the economic crisis in 1991, JICA’s cooperation for two industrial corridors, and JICA’s cooperation to a number of important projects including metro projects in five metropolitan cities, Delhi-Mumbai dedicated freight corridor, forestry projects covering 13 states, water supply and sanitation projects focusing on important cities, human resource development of the manufacturing sector under the leadership of Dr. Shiba, Padma Shri awardee, and comprehensive assistance to Indian Institute of Technology, Hyderabad. When it comes to basic and urban infrastructure, what are the key areas of interest for JICA in India? JICA is committed towards development of both urban and basic infrastructure in various regions of India. About 51 per cent of our ODA loan commitment during 2000s and 2010s is towards the transport sector followed by water sector at 17 per cent, energy sector 15 per cent, and forestry & agriculture with 10 per cent. Our ODA commitment depends on requests submitted by the Government of India and the sectors of our assistance are decided by them. Once the request for a project comes, we send JICA staff and experts to examine the feasibility of the project in many aspects like technical, financial, social, environment and institutional and to see whether we are able to support the project or not. Once we think that the project is feasible and we are able to cooperate, we sign an agreement with the Government of India. The Delhi-Mumbai Industrial Corridor and the Chennai-Bengaluru Industrial Corridors are very important projects both for their significance to Indian infrastructure and the active participation of JICA. Tell us more about JICA’s role in these projects and their current status. The Governments of Japan and India, using public-private initiatives, agreed to develop the Delhi-Mumbai Industrial Corridor (DMIC) and the Chennai-Bengaluru Industrial Corridor (CBIC), including development of industrial areas for supporting economic development in India. JICA has been providing support through loans and technical cooperation as Official Development Assistance (ODA) for the development of DMIC and CBIC regions. As far as CBIC is concerned, JICA’s Preliminary Study (May 2012 – Oct 2012) identified immediate concerns and impediments with regard to investment in the region from the perspective of infrastructure development and policy options for the state governments. JICA together with the Central government and concerned state governments has developed a “Comprehensive Regional Perspective Plan for Chennai-Bengaluru Industrial Corridor Region” in 2014, where the need of huge infrastructure investments in the corridor ($181 billion) in 20 years (by 2033) was identified. In addition, JICA has developed a master plan in 2015 for the three selected Nodes, Ponneri in Tamil Nadu, Tumakuru in Karnataka, and Krishnapatnam in Andhra Pradesh. At the same time, stakeholders including the Central government, state governments, Government of Japan and JICA have identified 34 prioritized infrastructure projects. JICA understands that after completion of the study, the Central and state governments have been making great efforts to realize the CBIC master plan. 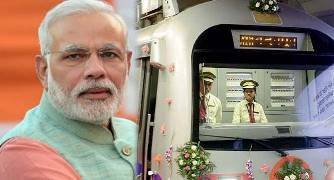 Please discuss JICA’s role in the Delhi Metro Rail, which has been amongst the most successful urban transportation project in India. Is JICA also looking at other Indian metro rail projects as well? JICA has extended ‘soft loan’ for development of the Delhi metro amounting to JPY 651.53 billion (as of October 2015). The Delhi Metro was developed in phases: under the first and second phases developed by 2011, 190km serving 142 stations in the city and its suburbs of Gurgaon, Noida, Ghaziabad and Faridabad were built. In the third phase, to be developed by 2016, additional 116 km serving 76 stations in the city and its suburbs would be added majorly under JICA assistance. The first phase of Delhi Metro covering an area of 65 km system was completed in 2005, two years and nine months ahead of the schedule. Similarly, the second phase to add another 125 km was completed not only within the estimated cost but well within the scheduled time period in 2011. This has been viewed as a miraculous milestone achievement especially in the infrastructure sector in India. The project has sent very strong signal that with dedicated commitment, hard work and sincerity, the country can make remarkable progress. Delhi Metro is a shining example of the India-Japan cooperation. We have been providing loans, as well as necessary technical assistance, for the construction of Mumbai (Line-3), Chennai, Kolkata, and Bangalore metro projects. JICA, as we understand, engages only in government-backed projects. Please discuss. Yes. JICA is the implementing agency of Official Development Assistance (ODA) of the Government of Japan, working on the basis of an agreement between the Government of Japan and a recipient government, and an official request from the recipient government is always a prerequisite to JICA’s cooperation. We observe that JICA was associated with a power distribution upgrade project in Bangalore. Given that power distribution has traditionally been a weak area, how do you see the future role of JICA? JICA is currently financing three projects for power distribution in Karnataka, Andhra Pradesh (and Telangana), and Haryana. Poor financial condition of discoms is caused by several issues such as power theft, mismatch between tariff and cost, inefficient collection of power bill, and technical loss. This is structural issue which is difficult to solve only by financing. In this regards, we understand that our important role for the area is not only for financing, but for strengthening the financial condition through technical assistance. We believe these activities will lead to Sustainable Energy for All (SE4All). Tell us in brief about the objectives of the VLFM programme and how it could further human resource development. The purpose of VLFM/CSM (Project for the Visionary Leaders for Manufacturing (VLFM) Program from 2007 to 2013 and Project on Champions for Societal Manufacturing (CSM) from 2013) is to create visionary leaders skilled to transform Indian manufacturing by conveying the management concept of the Japanese manufacturing to the senior and middle managers. For this purpose, VLFM/CSM Program has highlighted the “BIG M” (manufacturing) concept which covers the entire manufacturing ecosystem from concept creation of new product to after-sales service. VLFM/CSM Program provides four different courses targeting inclusive human resource development in Indian Industry. What are the key areas that JICA is involved in with respect to urban environment development (water supply and waste management, for instance)? JICA has assisted improvement of water supply and sewerage, focusing on the major metropolitan areas, large cities, and industrial areas including Delhi, Bangalore, Hyderabad, Agra, Amritsar, Varanasi, and Amritsar. We have also assisted water supply and sewerage infrastructure improvement in the area facing serious health issues because of fluorosis and arsenic included in groundwater. In those cities and areas, JICA has been supporting the development of water supply and sewerage treatment infrastructure together with introduction of volumetric-based tariff system, metering system, improved billing, efficient tariff collection, water loss reduction activities, promotion of water saving practices, and promotion of private sector participation in service delivery and recycling water. Due consideration has been given for the underprivileged, particularly in the urban areas. Around 30 million people will receive water supply through projects supported by JICA in India while 15 million people will be benefitted by the JICA sewerage projects. How does India compare with other emerging economies insofar as JICA’s assistance to infrastructure building is concerned? There is no difference in JICA’s assistance to infrastructure development between India and other emerging countries. What is your view on India’s overall pace of infrastructure development in India and how do you see the road ahead for JICA’s engagement in Indian infrastructure? JICA views infrastructure as one of the most important obstacles for sustainable economic and social development of India, which view was also indicated by various studies and voices of a number of Indian and foreign private companies. JICA will continue to focus on infrastructure development, giving more attention to quality, sustainability and operation and maintenance of infrastructure.